—"So cute! So soft — can they really be pure wool? Wish it would be winter soon! ", are the comments we frequently hear about the mittens. They are made of double layers of stretchy merino rib, and thus easy to put on. Long elastic cuffs keep the mittens in place and the wrists warm - can be folded down, if preferred. 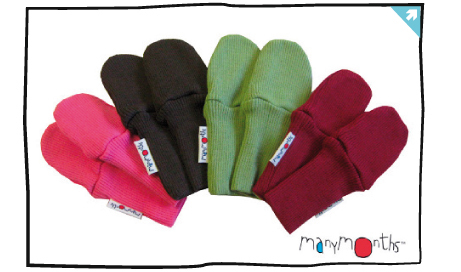 The smallest size (NewComer/Charmer) is made without thumb and its fine if the mitts end up in the mouth from time to time being 100% natural. Wool can absorb a third of its own weight in liquid and still feel warm and comfortable. Very important in the cold season, and during snow play. Wear as such during fall and spring, and combine with a padded or furry glove during the coldest winter days. Perfect for babywearing, also underneath a cover or panel jacket. A great match with the booties and hood. Let the children choose their favourite colours! There is plenty of choice.